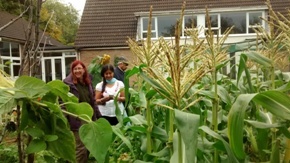 (25 October 2016) – The Annual General Meeting for members of the Permaculture Association will take place on 19 November in Graceworks, a permaculture project and community garden in the city of Leicester. The Annual General Meeting itself will take place in the morning in Evington United Reform Church followed by a light lunch. Then an afternoon ‘Thriving Communities Gathering’ where anyone is welcome to attend. Sessions will focus on projects working with disadvantaged communities and in urban environments. How can permaculture be used to address social challenges?